The chaga mushroom (Inonotus obliquus) is often called: birch fungus, birch chaga, or simply chaga. These are sterile growths on hardwood trees such as elm, ash, maple, mountain ash, but most of all, they occur on birch and alder. These growths appear on the damaged sections of a tree (in places that are cracked or sunburnt, and where branches and twigs are broken off, etc. ), which the spores from this fungus occur. 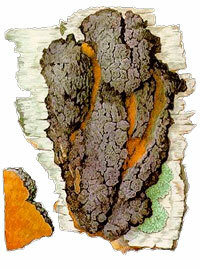 Chaga’s fruiting bodies cause the cordate white rot of the trunk. The chaga mushroom can affect both living and dead trees. Chaga, like all fungi, reproduce by spores. By entering under a tree’s bark, the spores germinate and form a plurality of branched fungal filaments or hyphae. Over time, these hyphae become larger and, due to pressure, the fungus cracks the bark and black outgrowths, covered in cracks with jagged edges, appear on the tree’s surface. These are called chaga. Chaga’s fruiting body has an irregular shape and is prostrate, a width of 30-40 cm or more, and 10-15 cm thick. Depending on its size and density, its weight can be quite impressive, ranging from 1.5 to 5 kg. The entire surface of the fruiting body consists of tubes, inclined to the surface at an angle of 20-30 degrees. The tissue under the hymenophore (the part of the fungus’ fruiting body that carries a thin spore-bearing layer on the surface, known as the hymenium, in which a large amount of spores are formed) is virtually absent or very thin. The pores are usually stretched and are angular-rounded. It is leathery-fleshy in consistency, and is hard upon drying up. Immediately after being freed from the bark, the colour becomes a whitish woody shade, and the old fungi become blackish-brown. Sometimes there are remnants of birch bark remaining on the fungi’s surface. The fungus grows slowly until it becomes medium-sized; this takes at least 8-10 years. In some instances, the total lifespan has reached more than 20 years. Thus, the host tree inevitably dies. "Chaga is a perennial parasitic fungus of the Hymenochaetaceae family, parasitizing on tree trunks. 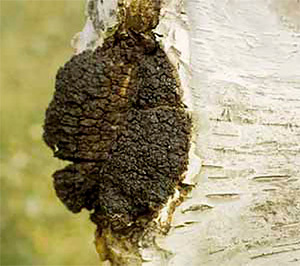 Most often, chaga can be found on the trunks of old birch trees, and it more rarely affects other trees, such as alder, rowan, beech, elm, and maple. Only birch chaga has a curative effect". For therapeutic use, birch fungus is only collected from live birch trunks. In this relation, it should be recalled that the old crumbly chaga is not suitable for use in medical treatment. In addition, it is necessary to distinguish chaga from other fungi of the Hymenochaetaceae family, for example, from false tinder (Phellinus igniarius), which also grows on birch. 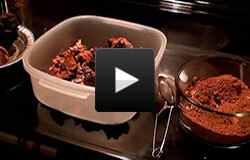 Its main distinguishing factor from chaga is the shape of the fungus’ body. False tinder has is hoof-shaped; the upper part is convex; and the lower part is flat. 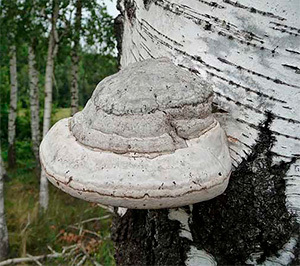 The surface of this fungus is softer than that of chaga, and is a velvety grey colour with dark brown concentric circles. Usually false tinder, unlike chaga, is found on dry and fallen trees, and only occasionally is it found on live ones. 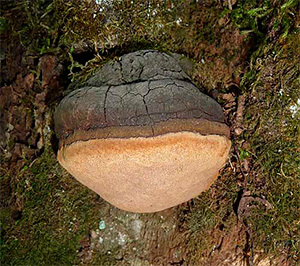 It is also necessary to distinguish chaga from the tinder fungus (Fomes fomentarius), which is semicircle-shaped, grey or brown with a smooth surface, and is attached to the tree only owing to the central part of the fruit. Unlike the birch tinder fungus, it can be easily separated from the stem. For therapeutic purposes, neither the false tinder nor the tinder fungus is used. The inner layer is reddish-brown, with yellowish fibres. On the inner surface of the fungus, which adjoins the tree trunk, there is no spongy layer as observed for other fungi of the Hymenochaetaceae family. Chaga can be found everywhere where birch trees grow. The area of this fungus’ distribution is quite broad, accounting for virtually the entire forest zone and forest-steppe zone in the northern hemisphere. However, chaga is not tolerant to high temperatures, so it is not found on birch trees growing in extreme southern latitudes.